There is a long tradition of unofficial or fantasy stamps, known to collectors as “cinderellas”. They are distinct from those issued by the official authorities, usually sovereign nations or dependencies, who are members of the splendidly-named Universal Postal Union, which always gives the impression that it expects its services one day to reach to Mars or even Neptune. The design and form of these cinderella stamps varies. Some betray their impromptu or amateur origin: but many look just like “proper” postage stamps: they are gummed, perforated, with a value, a notice of origin and artwork often at least equal to the conventional issues. Examples in Britain include those issued for use by offshore islands, such as Lundy, in the Bristol Channel off North Devon, which do not have a Royal Mail service, and therefore offer a local post to the mainland. 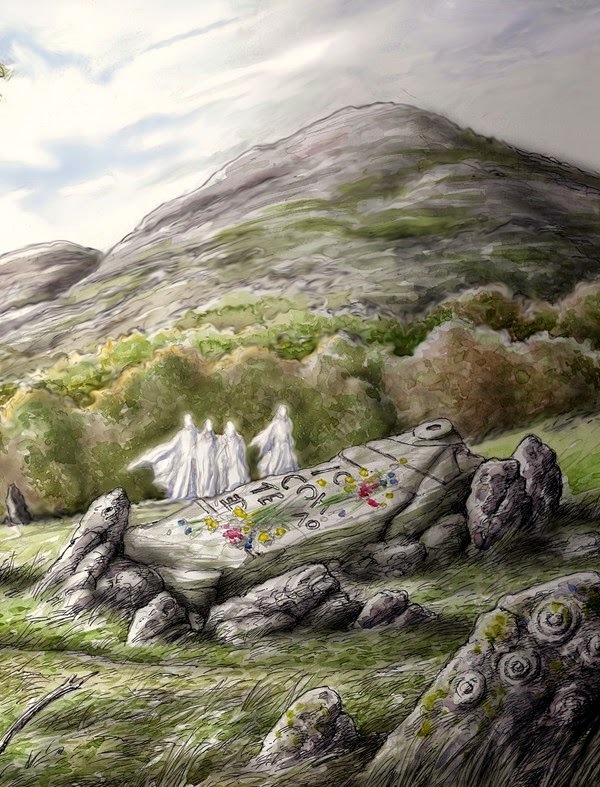 I wrote about a fictional local post of this kind, for one of the Islands of Fleet off Galloway, South West Scotland, in my story “The Prince of Barlocco” (available in The Collected Connoisseur). For a while, experiments were made in sending post to remote islands by small rockets, such as to Scarp in the Hebrides. These were not always successful, and singed examples of such Rocket Post stamps, letters and cards are now highly collectable. Railways in Britain were also allowed to carry parcels, and letters (between stations only), alongside the Royal Mail monopoly, and some therefore issued their own “railway letter stamps”. Most such stamps, however, are not used to pay for carriage, but are more like a form of miniature art or fiction. From Victorian times onwards, advertising stamps were issued to publicise exhibitions and trade fairs: these are often known as “poster stamps”. As well as these, however, there has also been a thriving tradition of purely “fantasy” stamps. 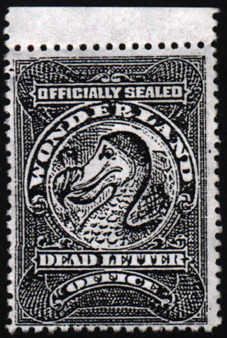 The most notable of these are the Wonderland stamps designed and issued by artist and philatelist Gerald M. King. 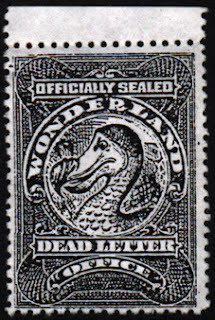 This came about when he was dismayed that the Post Office declined to honour the centenary of Lewis Carroll’s Alice's Adventures in Wonderland in 1965 with an official stamp. He therefore decided to celebrate the occasion himself, and imagined what sort of postal service Wonderland might have. The result was a charming and beautifully made series of stamps featuring characters and scenes from the book, some involving nice puns (eg "Hare Mail", and the Dodo Dead Letter Office). 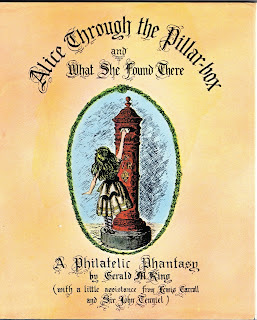 These also appeared in an illustrated album, Alice Through the Pillar-Box: A Philatelic Fantasy (1978). Mr King has gone on to create further stamps set in imaginary worlds, including a mingling of Wonderland with Lundy, and others that contemplate several alternative histories. 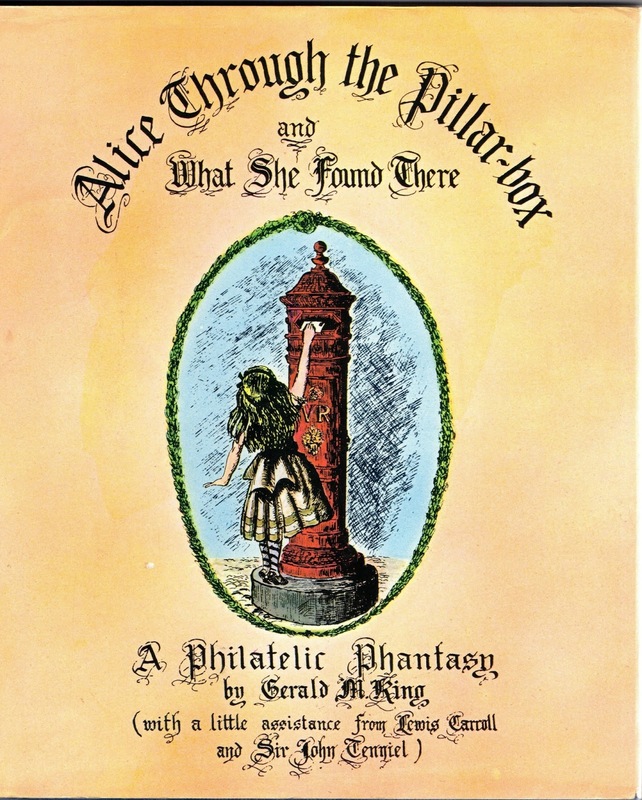 These are the talismans of untold stories, and Gerald M King's marvellous work is well worth celebrating in the 150th anniversary of Alice’s Adventures in Wonderland. 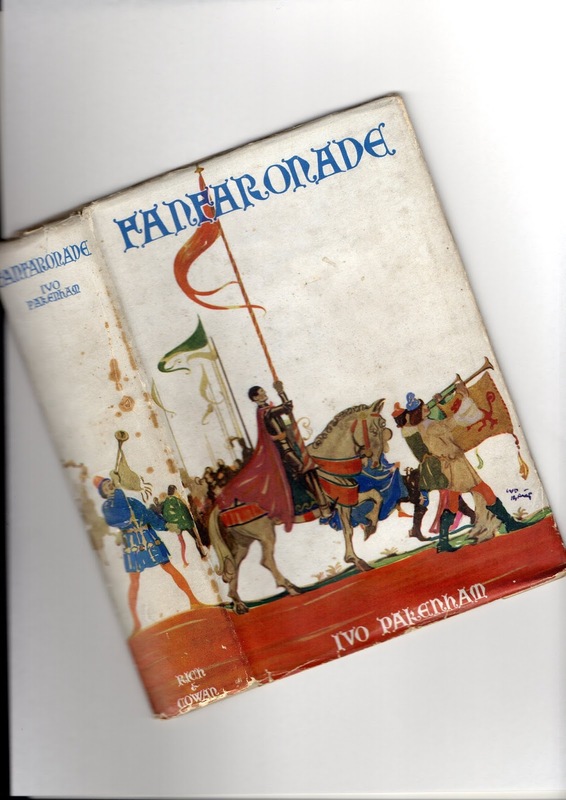 Fanfaronade (1934) is a well-written and distinctive timeslip novel, the only published book of Ivo Pakenham. Although there seems to have been just one edition, at least two bindings are known, in scarlet and black. It starts in contemporary times as a brother and sister are driven through a forest road in Autumn to a 14th century chateau. The young man is deeply interested in medieval history, the editor or author of a number of acclaimed works on the period, and is gently ribbed for living in the past (there is probably much of the author himself in this). He contemplates a book one day on the strange history and symbolism of playing cards. While exploring the castle he misses his step in a stone passage and awakes to find he has entered a medieval world where he is the young Duke of an independent domain embroiled in wars, plots and feuds, forever fighting to remain free from greater powers. The period is vividly evoked, with an eye for telling detail. In the gorgeousness of the scenes and the intricacies of the court there is some affinity with such works as E R Eddison’s Zimiamvia fantasies, Baron Corvo’s Don Tarquinio, or Leslie Barringer’s Burgundian novels. “In Fanfaronade Mr. Ivo Pakenham has written a first novel which is almost startlingly different. Not content with this, he has also succeeded in combining an amazingly intimate knowledge of medieval history with a rare ability to clothe its dry bones in a richly-woven mantle of romance. The chief thread of the tale is a mystical throwback which links our days with those of the fifteenth century. The hero himself is unconscious of his metamorphosis, for it is only at the last that he is vouchsafed the vision of his past which is unknown to all those around him. This intriguing standpoint should be welcomed by the large public which is interested in such problems. The author has painted for us a magnificent picture with a wealth of colour which should entrance even the non-historical reader. On his canvas courtiers, priests and lovers, banquets, tournaments and pageantry glow against a dark background of treachery and witchcraft, politics and war. The dramatic interest of the plot is so great that unless the reader simply cannot bear the suspense and looks at the end, it will keep him anxious for " what is coming next " until the last page is turned. Alas, no other work of fiction by Ivo Pakenham is known. The book is co-dedicated to the author’s mother (“who did not live to see it published”) and to Maurice Lincoln (“fellow author”) with thanks for their “kindly sympathy and helpful criticism” which helped ensure the book was finished. Lincoln was the author of four novels in the Twenties and Thirties, including the fantasy The Man from Up There (1928). There is an epigraph, giving the source of the book’s title: “So much by way of fanfaronade before the showman pulls the strings”, from Paul Foster’s Daughter, vol 1, by Dutton Cook, the largely forgotten Victorian journalist and author of about a dozen novels, and books about the theatre. This is followed by the author’s foreword, signed London, July 1934, which explains that “many months of intensive preliminary reading were necessary before this book could be started at all”, and lists the history books he used as sources. He also explains the approach he has taken to the difficult question of dialogue in historical fiction, too often marred by “godwottery”: “To use modern language seems to me to be a slovenly way of working, while that of the “cloak and sword” school is unquestionably worse…All I have tried to do, therefore is to endeavour to catch the cadence and intonation of fifteenth-century speech…”. In this he is quite nicely successful, achieving a fine compromise. The reference to the recent passing of his mother enables us to identify the author from amongst a number of a similar name in his family. He was Ivo Robert Raymond Lygon Pakenham, born 4 December 1903, the son of Capt Robert Edward Michael Pakenham, born 28 July 1874, Royal Munster Fusiliers, who served in the Boer War and the Great War, and died of wounds 17 January 1915, and his wife Nancye Fowler, died 19 March 1934. His book was published in September 1934, just six months after his mother had died. I was helped in this identification by a relation of the author, Katherine Pakenham, who kindly gave me a few further details. As in the protagonist in the novel, the author had a sister, Emilie Estelle Rosemary Pakenham (1907-1932). He never spoke of his book, which was unknown to his wider family, and this seemed unusual because Ivo was “a flamboyant character”: “we're still baffled why he should have kept the book's existence so quiet, or indeed why there were no successors,” she told me. However, he devoted a lot of time to the genealogy of his family and emblazoned an elaborate family tree: Fanfaronade demonstrates a lively interest in medieval heraldry. Ivo Pakenham lived in Kensington and was an antiques dealer, described as “very knowledgeable”. He died in the 1980s in a nursing home on the south coast. His one work of literature certainly deserves to find a discerning readership. The newest update of the FictionMags Index brings current the checklists for many magazines of interest to Wormwood readers. There is a lot of interest at the FictionMags Index and other associated Homeville bibliographical websites. Check them out.